I hope everyone had a nice Easter weekend. While not everyone celebrates Easter, for those that do there are many different traditions. Some people get dressed up and go to church. Others will have a special Easter brunch or Easter dinner. And of course, kids love going to an Easter egg hunt and eating lots of chocolate. In Texas, it is a great day to get dressed up and take a picture in the bluebonnets. 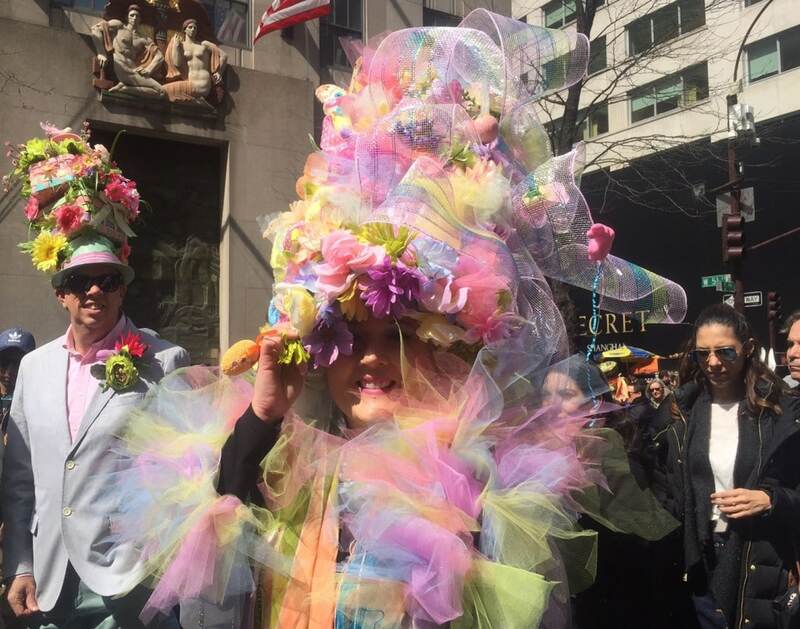 But in NYC the last few years, I have started celebrating Easter by going to the NYC Easter Bonnet Parade on Fifth Avenue. It wouldn’t be an Easter Parade without the Easter Bunny! The Easter Parade has been around since some time in the 1870s! The parade is more a spectacle of fashion than a religious event. In 1933, Irving Berlin wrote a song called the Easter Parade. Thanks to pictures that my friends posted on Facebook, I finally decided to check it out. Lots of pastel, perfect for Easter. While it can get crowded, it is really a lot of fun. It is not a typical parade. A section of 5th Avenue from 49th street to 57th street is blocked off to cars. 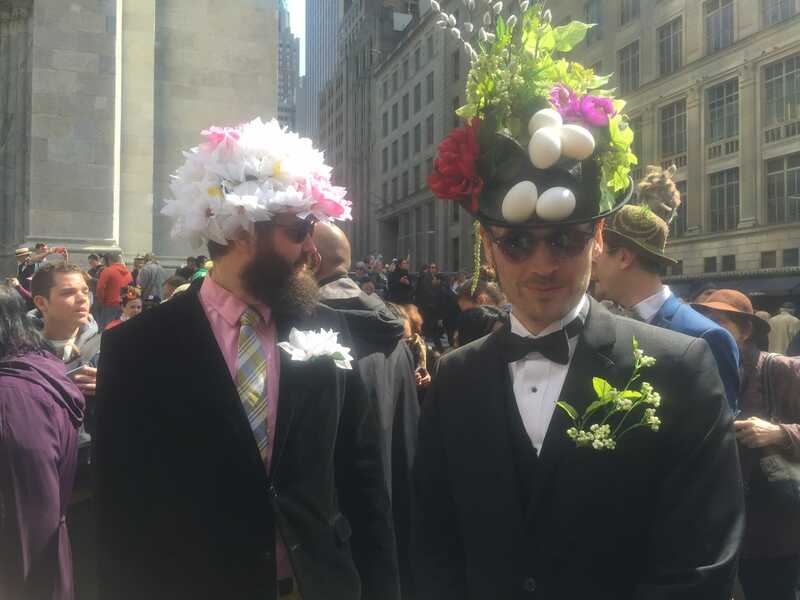 Everyone just walks around and checks out the best Easter bonnets and costumes. There are all types of costumes, some would probably also work for the Halloween Parade. One year, I even found an Abraham Lincoln impersonator. This could probably work equally well as a Halloween costume. Some people wear traditional Easter dresses with hats and look so stylish. Others wear huge colorful hats. 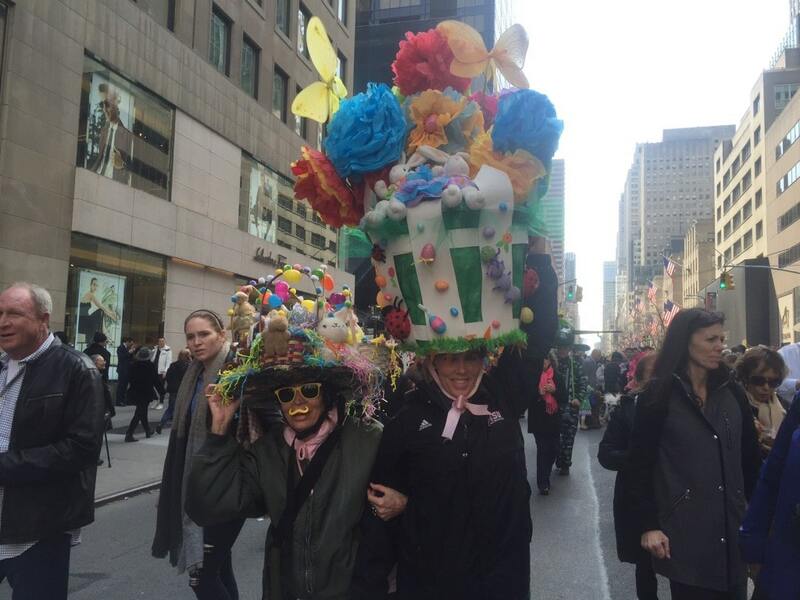 I am always impressed with people’s Easter Parade hat ideas – so creative and artistic! I have seen hats made from all kinds of things. 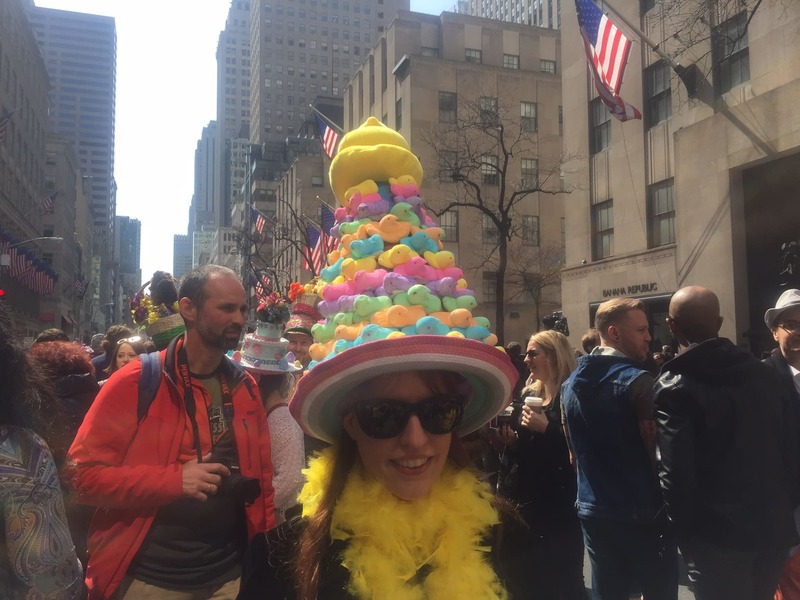 I think the best Easter bonnet ideas are the ones that use Easter Candy (Peeps!) or Easter Baskets. I really like this one, so artistic and colorful. This bonnet has got to be heavy! 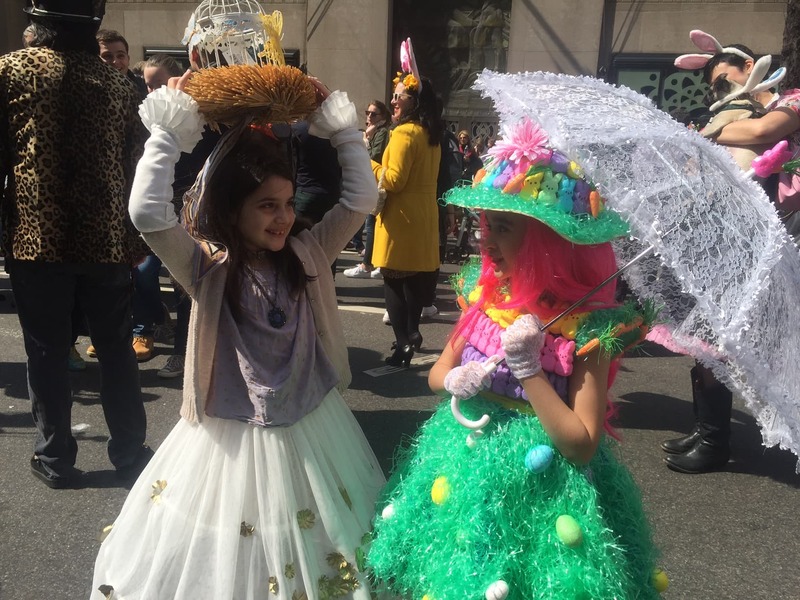 The Easter Bonnet parade is a family event for kids of all ages. I love seeing all the kids dressed up. There are also always plenty of dogs and many of them have costumes too. I have also seen whole families all dress up in a theme. Normally, people might think it was odd if you tried to take pictures of random people. 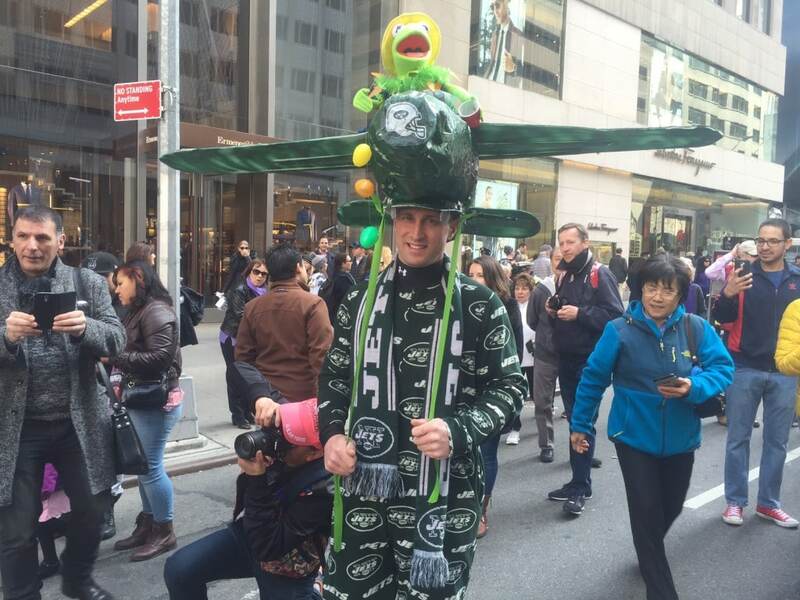 But during the Easter Parade, people take it as a compliment if you ask to take their picture. Aren’t these kids cute? Love the grass skirt with eggs hidden in it. Even the dogs get in the Easter spirit! 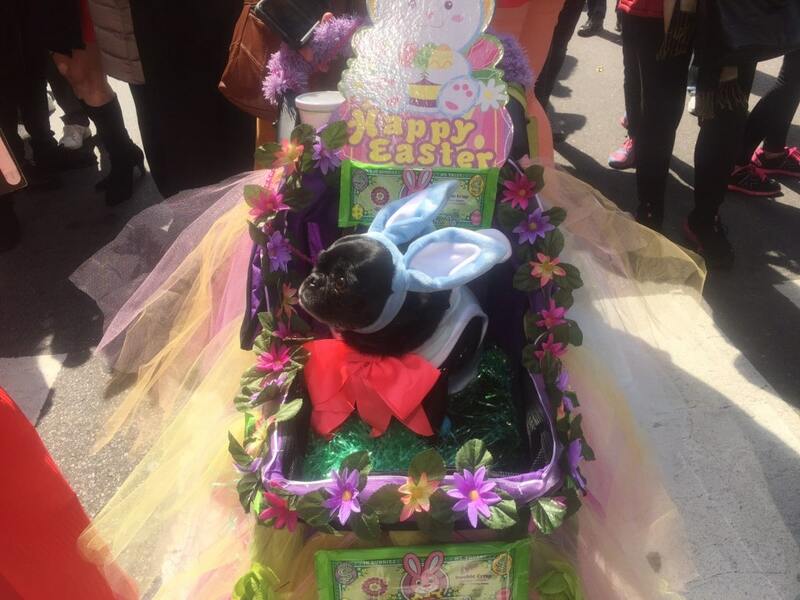 The Easter Parade is just a really fun and laid back event – anything goes! I love seeing Easter on Parade with all of the spring colors. 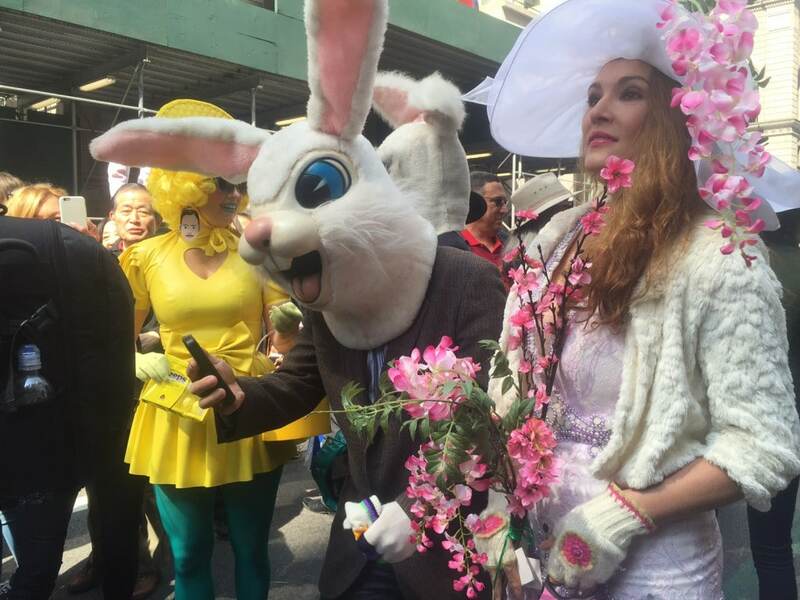 You can get a better idea of what the Easter Parade is like by watching my video. Don’t worry if you don’t have an Easter bonnet. Plenty of people go that are not dressed up, like yours truly. One of these years, I will get a group together and figure out something fun to wear. 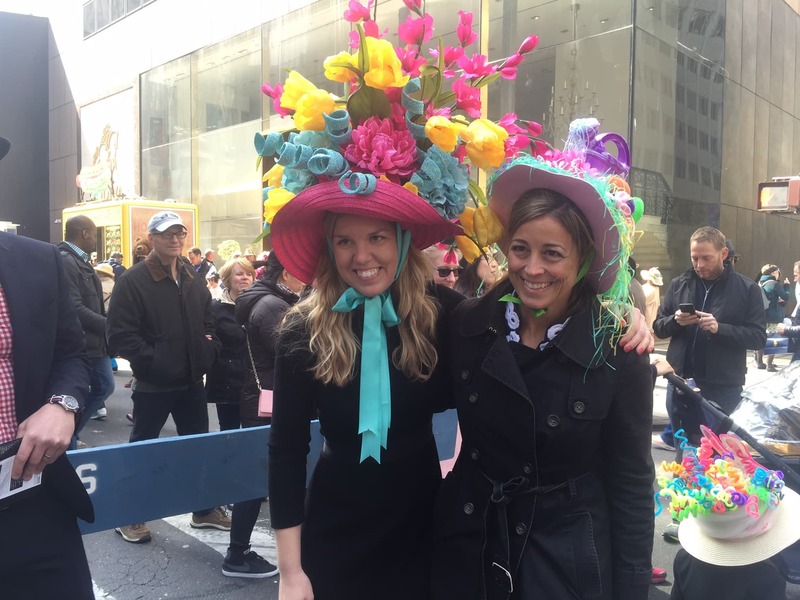 Maybe you have some Easter bonnet ideas? You don’t have to dress up to go to the Easter Parade, but don’t forget your camera! 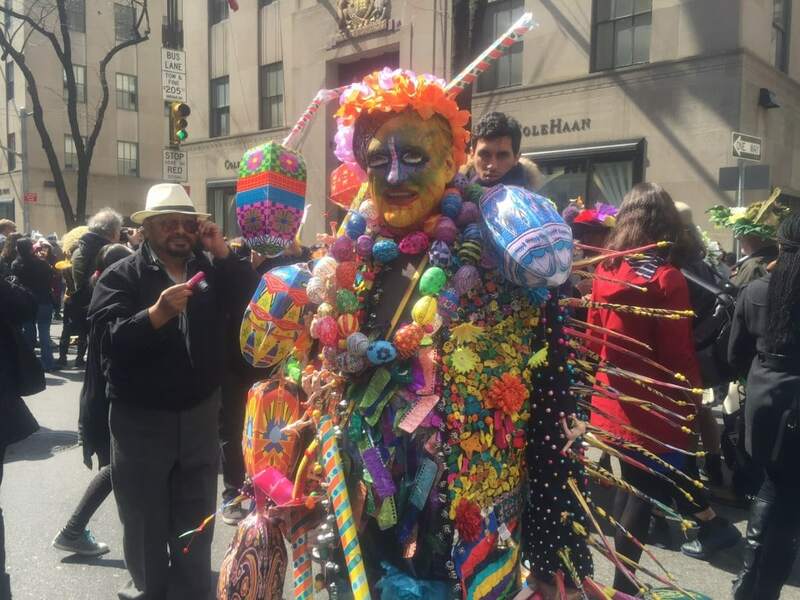 The parade is held Easter Sunday on Fifth Avenue from 49th to 57th Streets from 10 am to 4 pm. Teju – Thanks so much for coming with me. I’m glad you enjoyed it. We will have to do it again! My mom and I watched the classic Easter Parade movie on Sunday, and were wondering whether they still held the parade on 5th. Glad to see they still do it in style! Nice! I feel like I should probably watch that movie! Looks like a lot of fun! I don’t really celebrate Easter anymore, but I would go to something like this for fun. Yes Karen. If you get a chance you should go, it really is a lot of fun. Some people do go all out! Thanks Tanja. I did have a lot of fun. Hope you had a nice Easter too. OK, I’ve never heard of the Easter Parade. Of course everyone knows about the St. Patrick’s and Thanksgiving parades. Thanks for an informative and fun post! Glad you enjoyed it. 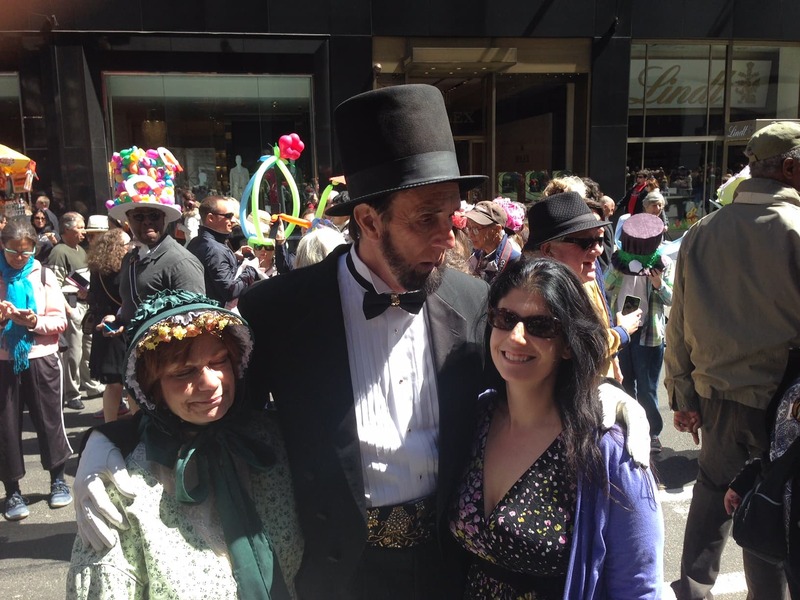 I didn’t know about the Easter parade until I had been in NY for awhile either! Not to detract from the Macy’s extravaganza every Thanksgiving, but it’s nice to see traditional parades like this, where regular people can participate. Dressing up seems like the perfect way to make the event extra special. Any excuse to wear finery, eh? Thanks for sharing this on #TheWeeklyPostcard. Thanks Linda. I agree it’s a great tradition.